When late morning or afternoon exhaustion sets in it may be your body's cry for protein. Getting that foggy, light-headed and cranky feeling means your blood sugar may be out of balance. The best remedy is to eat healthy snacks in between meals that balance blood sugar with healthy fats, protein and minerals. And, we know this sounds obvious, but we're all guilty of it—don't skip meals. Be sure to enjoy a wholesome meal at breakfast lunch and dinner for optimal health. Dipping a banana or an apple in delicious protein-rich nut butter such as almond butter, sunflower seed butter, cashew butter or peanut butter makes for an easy and healthy macrobiotic snack. The combination of protein and healthy fats with a small amount of fruit for sweetener complements any healthy meal plan. Many nutritionists and dieticians recommend having a protein snack mid-morning and mid afternoon before adrenal gland fatigue can set in. Don't wait until you're starving or shaky to eat. 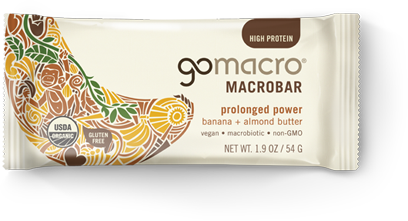 GoMacro prolonged power: banana + almond butter MacroBar is packed with almonds which are high in monounsaturated fats, similar to the health-promoting fats in olive oil. Almonds are a great source of vitamin E and an anti-oxidant that may help lower cholesterol and reduce the risk of heart disease. Almonds are also known to guard against diabetes by decreasing “after-meal” blood sugar spikes. All good. Our prolonged power: banana + almond butter MacroBar packs a punch with potassium with 342 mg of potassium per bar. Bananas provide many vitamins and minerals that are essential for health but the biggest player is potassium. Potassium plays a fundamental role in nerve function and muscle control but most of all it helps lower blood pressure. 98% of Americans eat more than twice as much sodium than is recommended for a healthy diet. Cutting sodium intake by half would decrease high blood pressure by nearly 26%. Guess what? The more potassium we consume, the more sodium is excreted out of the body. Another win-win. Potassium is also known to help relax blood vessel walls as well as regulating water and mineral balance throughout your body, all of which contributes to lower blood pressure. Now that is the power of potassium. We added organic cinnamon to ourprolonged powerMacroBar for its warming quality and other benefits. The benefits of cinnamon on blood sugar control have been well documented. According to a study in the American Journal of Clinical Nutrition (2007), seasoning a high-carbohydrate food with cinnamon helped lessen its impact on participants' blood sugar levels. It's believed that cinnamon reduces the rise in blood sugar after eating because it slows the rate at which the stomach empties after meals. Cinnamon may work in another way to help lower glucose levels. It appears to bring blood sugar levels in people with Type 2 Diabetes to normal by improving their cells' ability to respond to insulin. This occurs due to the ability of compounds in cinnamon to stimulate insulin receptors. In addition, these compounds inhibit an enzyme that inactivates insulin receptors. We all know what real food is: nuts, seeds, grains, vegetables, fruit and other things that don't come in a package or wrapper. Snacking on a nutrition bar containing "real food" may help reduce blood sugar spikes. The complex carbs containing fiber, vitamins and minerals take longer to digest and healthy fats from nuts and seeds slow the metabolism of carbs into sugar. The result is a more gradual rise in blood sugar. TIP: For an even slower burn, add an additional ½ - 1 Tbsp of organic almond butter to your GoMacro MacroBar. Great for dipping! The banana is the flavor star of this bar, but almond butter, sunflower seeds and chunks of walnut make a delicious and loyal entourage. Order now!